Outings are so much more fun when we can savour them through the children's eyes. 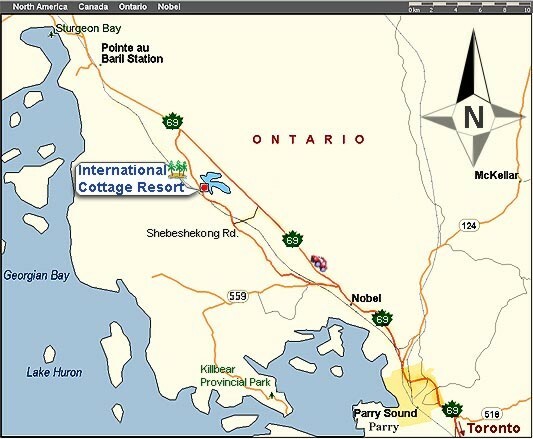 We are located in the heart of the Parry Sound and Georgian Bay area, home of the 30,000 islands. Only 2.5 hours north of Toronto via Hwy. 400 and 69, 25 km north of Parry Sound. Take Hwy. 400N towards Barrie, Hwy. 400N becomes Provincial Route 69/Trans Canada Hwy. Continue past Parry Sound, and past Nobel, and past side Road 559, which would take you to Killbear Provincial Park. Five minutes past Road 559, you will see Woods Road on your left. Turn left onto Woods Road, take this to the T intersection and then turn right onto Shebeshekong Rd. After about 3 km you will see our entrance on the right side of the road marked with the sign pictured below. Turn right into the lane, travel over the railway tracks (make sure to stop, look & listen!) and proceed straight on towards the cottages. All of the cottages are labeled by name.